Soundmit 2018, Nov 3/4, Torino! opening at 10.00, closing at 20.00.
or down with effect S/R and extra busses. fully transparent to fully parametric. or follow you on the road just as well. Your new analog audio console! 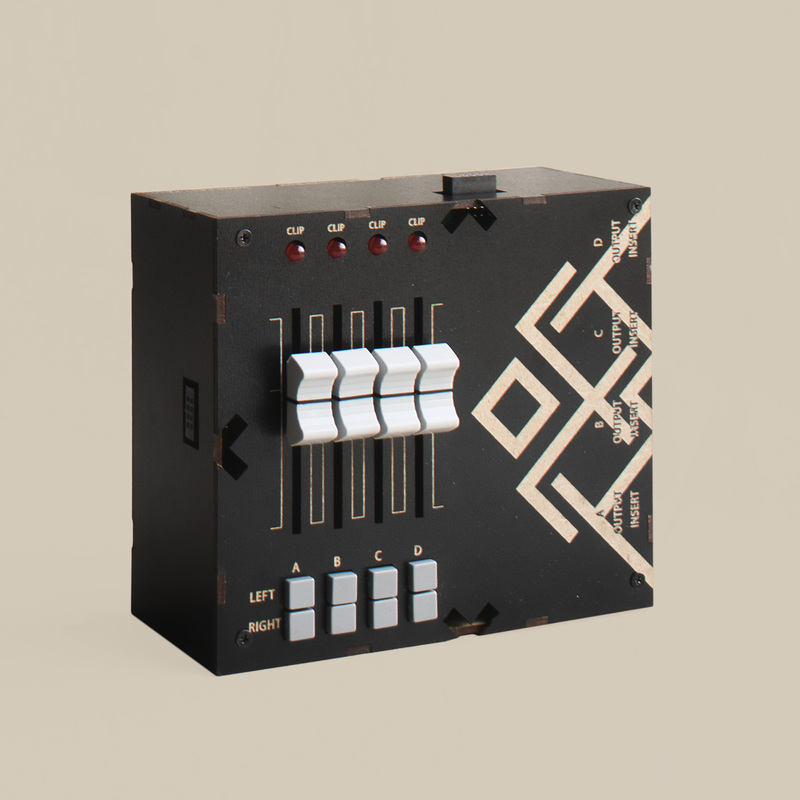 The Mixerblocks series is an original concept for a modular and expandable audio mixing console. A variable number of channel strips can be connected like building blocks between themselves and to a main I/O “docking” block. Each channel “block” can have one or more “extra blocks” connected to it, adding supplementary effect sends/returns or submix groups to the configuration. With Mixerblocks, you can keep adding channels to your console, each time you add a new instrument to your setup. In a similar way, you can add new FX send/return buses to use more effects. You can also add submix buses to help grouping your instruments. Some more devices (recorder/looper, vuMeter indicator, etc.) are being designed and coming soon. More than just adding up the sounds from each channel, Mixerblocks allows routing the channel signals to effects and/or (more interestingly) any submix buses, which in turn can be flexibly routed to the master outputs (left, right or both), processed through insert effects or connected to other devices through the individual outputs. And again, more blocks (devices) are being designed, which will further enhance Mixerblocks’ routing possibilities. 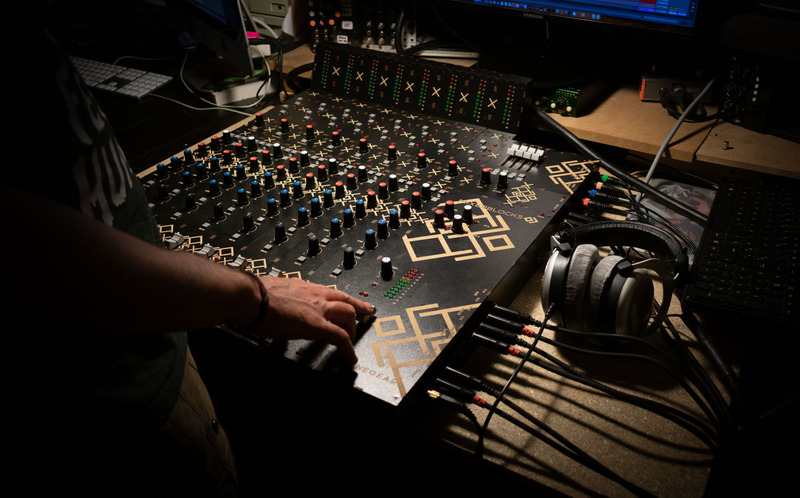 The Mixerblocks concept includes the possibility to design different kinds of channels with varying features and sonic behaviours (different types of preamps or EQs) so that the mixing console can truly adapt to any particular need by including a combination of channel types. This is also an open-hardware licensed product so that anyone who wants to (private or company), can design a compatible channel block or extra module block. 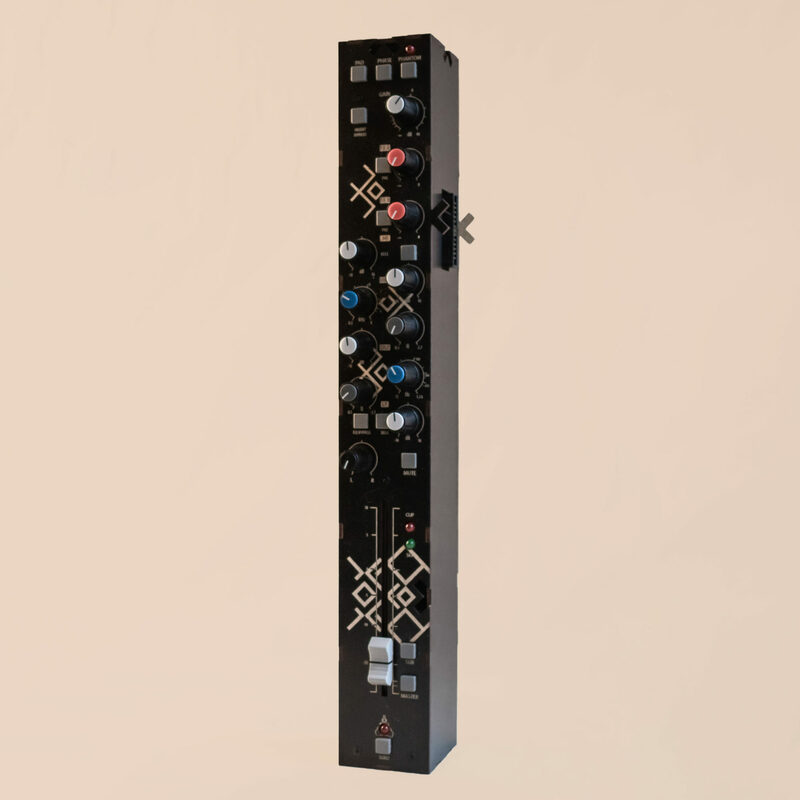 This block contains all the features/modules for a complete, transparent, channel strip. It is powered by, and it sends its signals to a docking block. 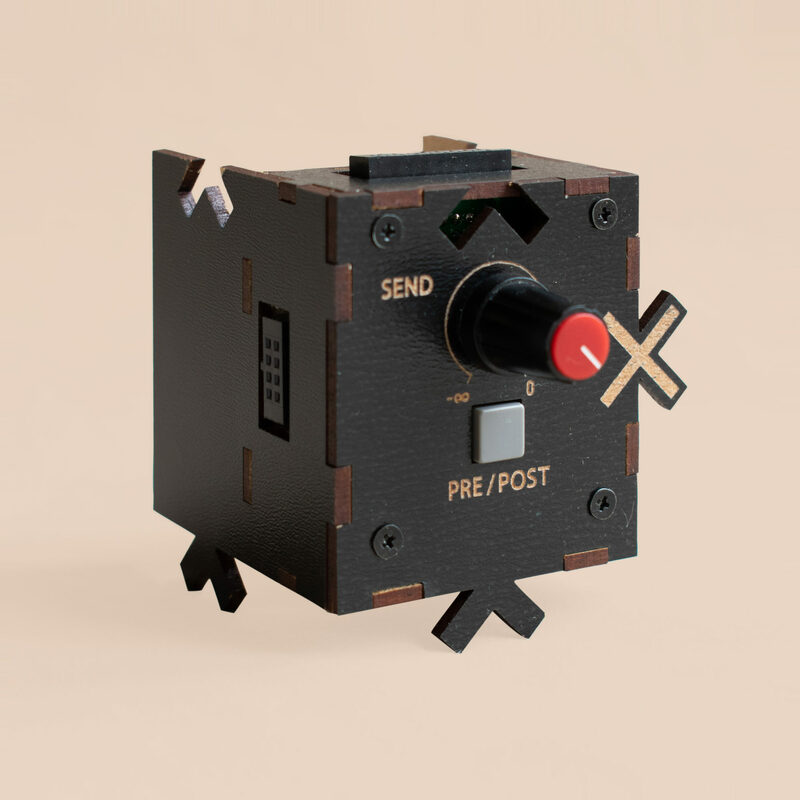 The central block for any Mixerblocks console, it powers the channels and it sums up the signals and sends them to the (balanced) outside world. The extra buses blocks add extra submix buses by groups of four. channels as well as a balanced output and an insert jack. connected to an effect’s input, while the effect’s output can be inserted in the console through a stereo (unbalanced) input. The extra effects send/return adds a supplementary effect send/return to the console. 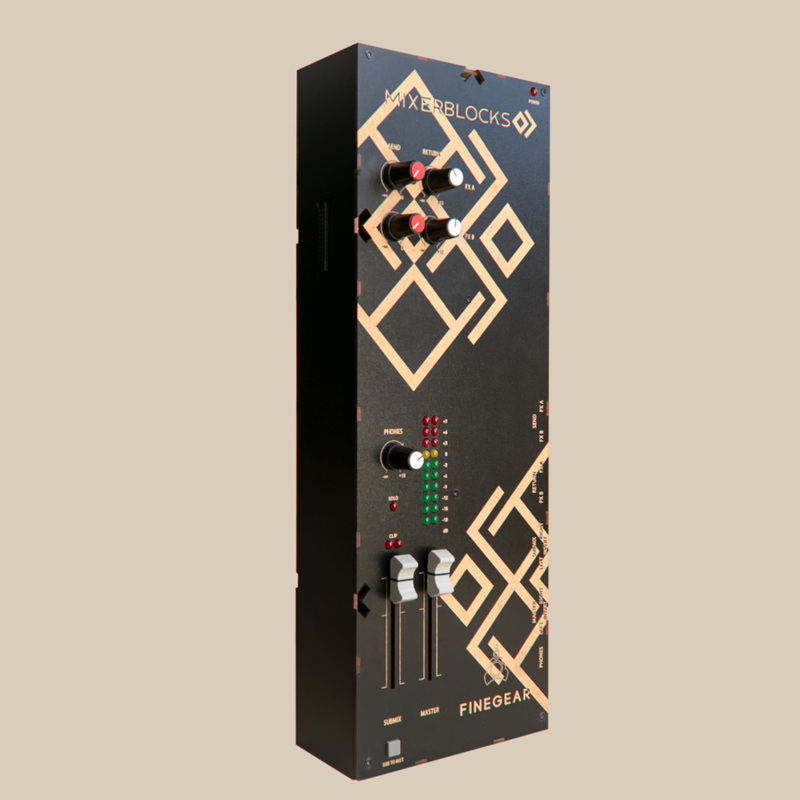 Thus, a channel’s pre-fader or post-fader signal (selected with the PRE/POST switch) is routed to a balanced audio output to be connected to an effect’s input, while the effect’s output can be inserted in the console through a stereo (unbalanced) input. 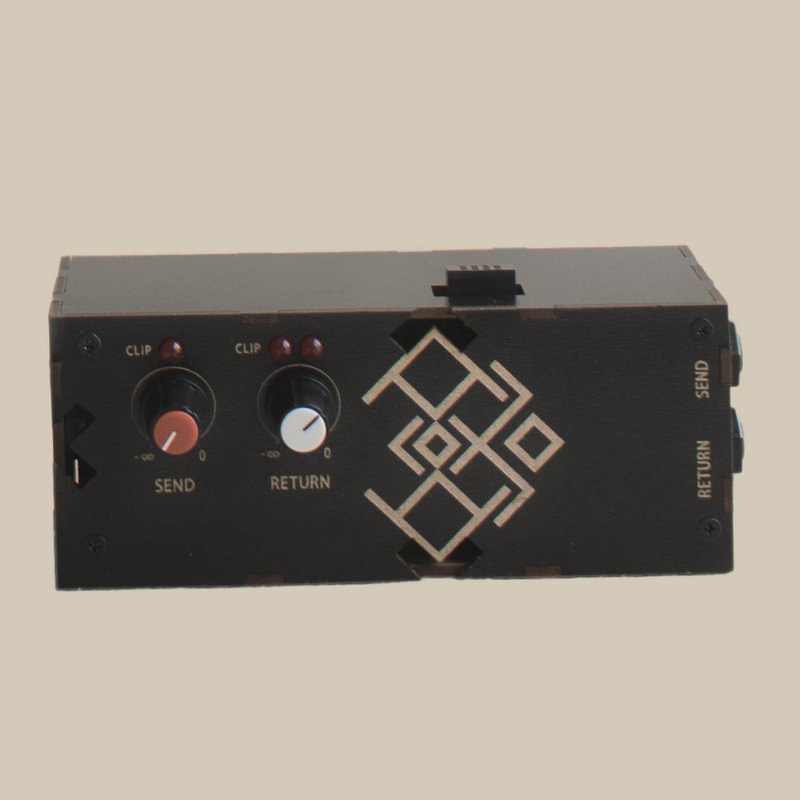 The extra meter and output block contains a 10 LED peak meter, a balanced output jack, an insert jack and a jumper to select if the signal is pre or post fader. Most of the components are already mounted and this ultimately is a very quick and easy build, nevertheless careful mounting is necessary for a good fit with the enclosures and between the blocks. The assembly instructions can be found here. The enclosures available for the Mixerblocks kits are MDF or sheet metal (coming soon). The MDF version gives a beautiful laser cut slick-looking console, whereas the metal enclosure builds up to a more classic console, suitable if you need to safely travel with it or if you want better shielding. Mounting the MDF enclosure is very easy, and very soon you’ll find instructions in the Documentation section. Also, if you want to adapt the design or just cut the enclosure yourself, that’s also where you’ll find the CNC-ready designs. 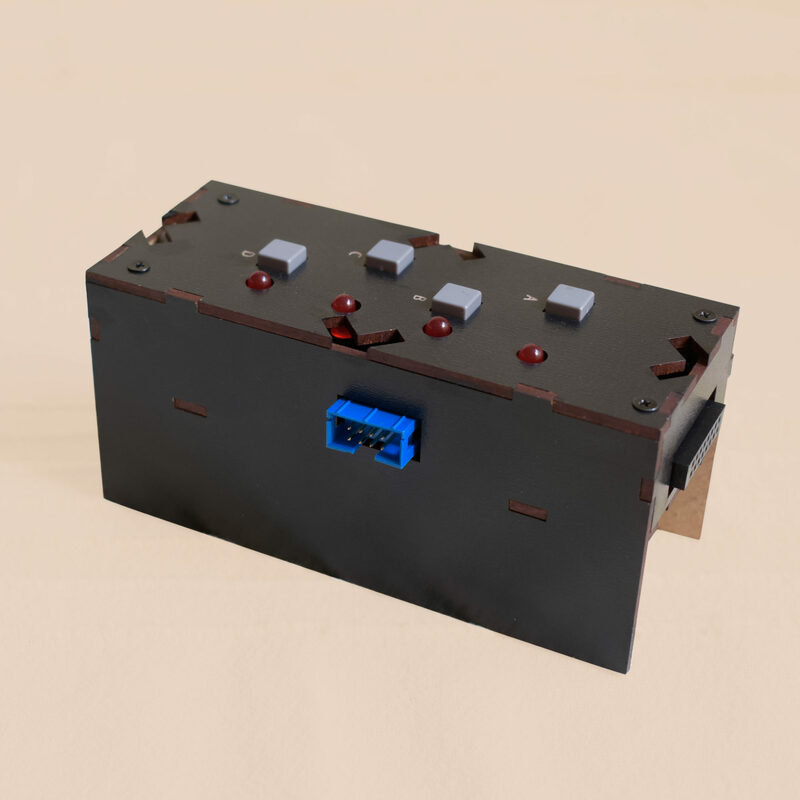 The Basic channel block is compatible with the Colour format series circuit blocks from DIYRE. 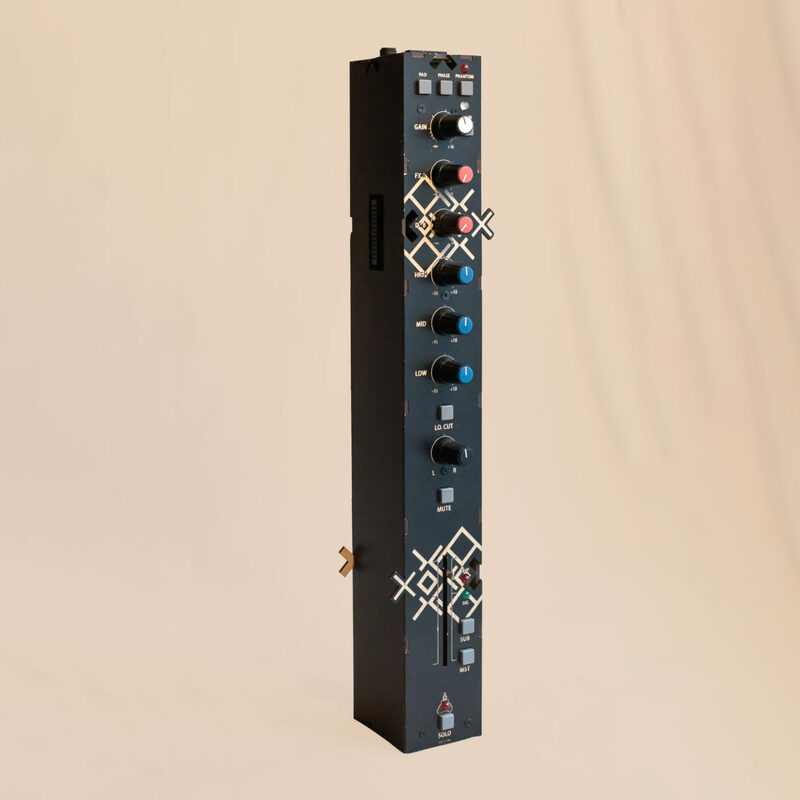 These are various small modules with a standardized footprint and connectivity that replicate certain classic analogue circuits’ sonic “color”. By using them, one can slightly modify (colour) a channel’s sound. A switch is used to bypass the module and an RGB LED indicates the “type” of Colour circuit that’s connected. In order to encourage DIYers everywhere to build their own consoles, other companies (or individual makers) to design new channel block types or extra blocks, as well as to be transparent, all the technical design documents are published under the cc-by-sa-4.0 license. If you want to know more than what’s shown in the signal path drawing, check out the links in the documentation section and study the schematics, PCB files and mechanical drawings on Github. 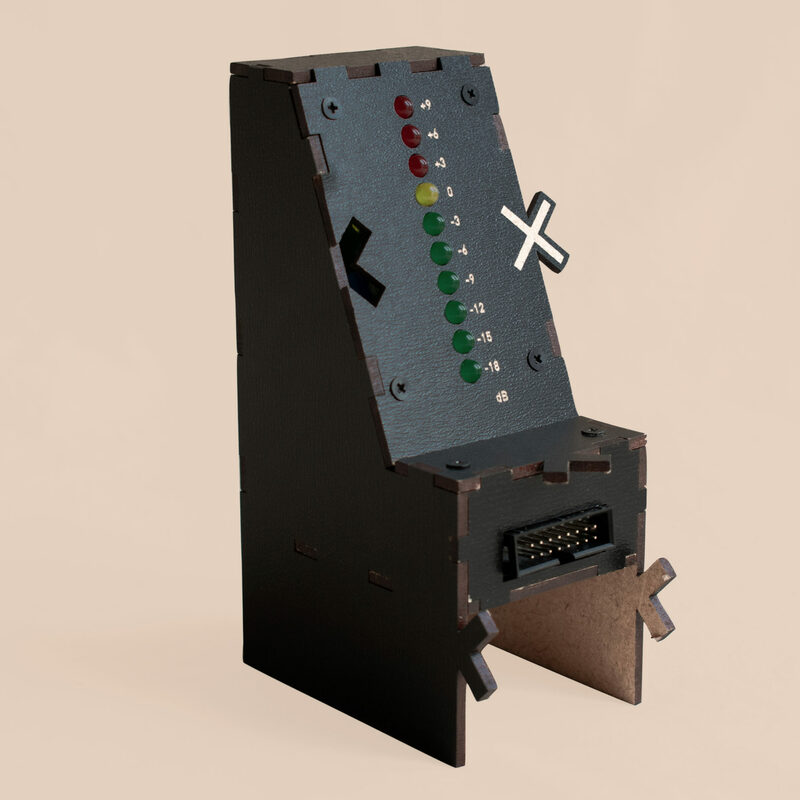 You encountered a problem or you’re not sure about something while building one of the kits? You want to share an experience you had building or using a Mixerblocks console? You have an idea for a new type of block or for improving on an existing one? You want some information or advice before deciding what to buy? Or maybe you just want to [understandably;)] show off your newly built Mixerblocks ? Come to our forum, you’ll find a place there for all these and more. We want to build a community of Mixerblocks users who exchange experiences and ideas to help each other and to help us evolve the Mixerblocks concept. Found what you wanted to know? This way to the shop! Making your own? Share your knowledge on the Forum!